Did you know that the answer to the age of the universe has been in front of us the whole time? It's written in the sky and it is being told by the stars, but we have forgotten how to listen. There are large opened source databases of accurate information on stars that have been gathered by NASA and CDS (Centre De Donnees astronomique de Strasbourg) using large multi-billion dollar telescopes, but the information is being displayed on tables only because the technology they use happens to be old and not up to date with current standards. We wanted to take this complicated legacy-like data set and make it much easier to understand by giving it a visual representation that you could interact with. People in general, have a better time recognizing patterns. Constellations are a perfect example of pattern recognition of shapes in our sky, and for a long time, people from all cultures have been recognizing and defining the shapes in the sky. We wanted to take this disorganized insensible data and make it something visually useful and understandable. The HR Diagram lets us understand more about the stars in the sky, their life cycles, spectroscopy (study of how light and matter interact with one another), astrophysics, dark matter (black holes) and dark energy, the expansion of the universe, and the formation of planets, solar systems, and galaxies. 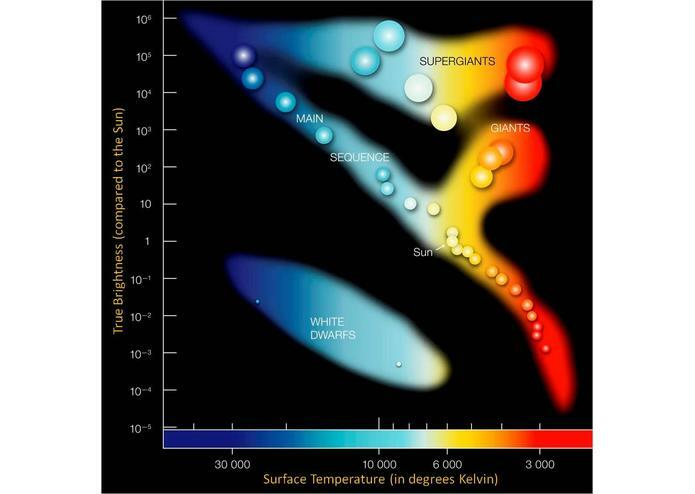 This diagram has even helped us find other earth-like planets within our own Milky Way galaxy. The vertical axis tells us about the star's Luminosity (brightness) and it's magnitude (size). The horizontal axis tells us about the temperature (in Kelvin) and spectrum color class which is divided into seven broad categories (hottest - left) O, B, A, F, G, K, and M (coldest - right) and can differ in subtle ways, so 10 more categories are given in representation of numbers. Brighter and hotter the star, the younger it is. Dimmer and colder the star, the older the star is. Main Sequence: Stars that act normally depending on composition and age. Dimmer older stars are made of lighter elements like hydrogen and helium, where as large stars are made up of denser elements like iron. Dwarf stars: (typically neutron) stars that have died, they are both hot but dim. Giants and Super Giants: Stars that are on the verge of dying but very large in size (still a couple of millions of years). Neutron Star: high mass stars. Low Mass Star: typically older and a hydrogen core star. Our sun is a third generation star (much older), and it has died two times already. These deaths help us understand the formation of planets from the remnants through a chaos of matter that are thrown into space that eventually cluster due to gravity. We understand most of this because of HR diagram. A lot of this information might seem a bit arbitrary and insignificant, but remember Albert Einstein couldn’t have proven his General Theory of Relativity without the data gathered by astronomers. It's information like this that help Einstien and other scientist understand about how the universe works as well as how gravity can bend time and space, or even discoveries like what matter or atoms are made of. Einstein’s theory has brought us technology like clean and powerful nuclear power, very accurate GPS that allow us to pin-point our locations very accurately, and the concept of warping time and space (which is actually not a science fiction concept, it is real!). The HR Diagram is the combination of work from Annie Jump Cannon, Ejnar Hertzsprung, and Henry Norris Russell. Ejnar Hertzsprung understood about the stars distance and luminosity. 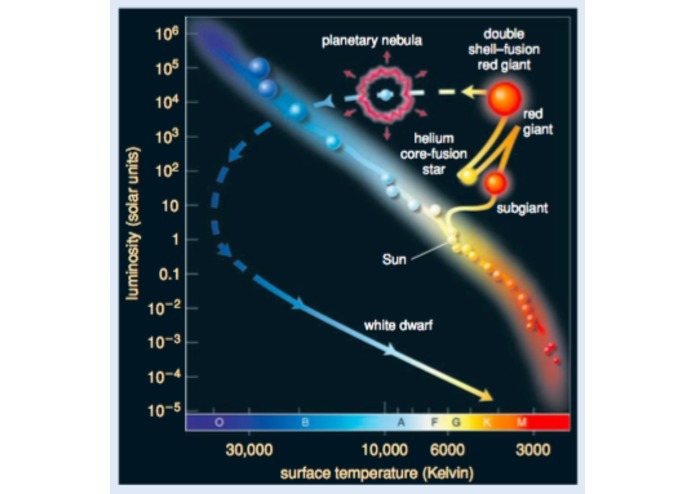 Annie Jump Cannon and Henry Norris Russell both understood the composition of stars and how different heat signature and colors can show different temperatures (kelvin) depending on what the star is made of. This information can have a significant impact on the scientific community as well as the possibility to change the world as we know it, just like Einstein’s General Theory of Relativity. Science is the cornerstone of innovation and new technology, but we found ourselves so deep in sounding sophisticated with these complex concepts that we convoluted the information that could be very vital for inspiration and discovery. We wanted to take this complicated data set and make it much easier to understand by giving it a visual representation. 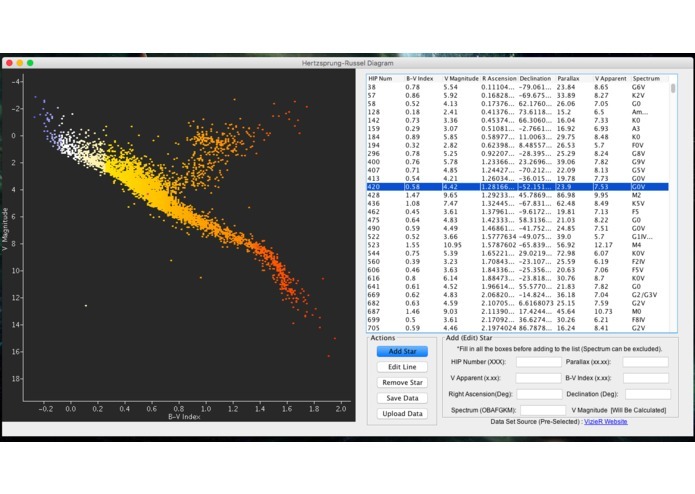 Our program allows you to take the data set (ASCII text/plain) from Vizier, upload the data, plot it properly in the main sequence (note: hotter temperatures are on the left of the x-axis and colder temperatures are on the right), and you can interact with the table to identify where a (or multiple) star lies on the diagram. We essentially built this project using Java and basic object-oriented programming and data structure concepts. Trying to sync up the database of Vizier which they do not have links for, it is only accessible by downloading a text or XML file. Java Applet could not work, and we could not sync it up to an HTML format because with the introduction of JDK 8.x, security permissions were changed. Self-signed applets and certificates are no longer allowed except by configuring java control panel to lowest current settings which would void secure programming practices. Only trusted certificates can currently be issued by Certificate Authorities. Most common browsers have stopped supporting java plugins as well. We also had problems with layout of the GUI on different operating systems, so we made two versions; one for windows and another for mac. storing the vast amount of data from Vizier (some information were missing or inconsistent). We built an input validation that will try/catch and throw exceptions when incorrect. 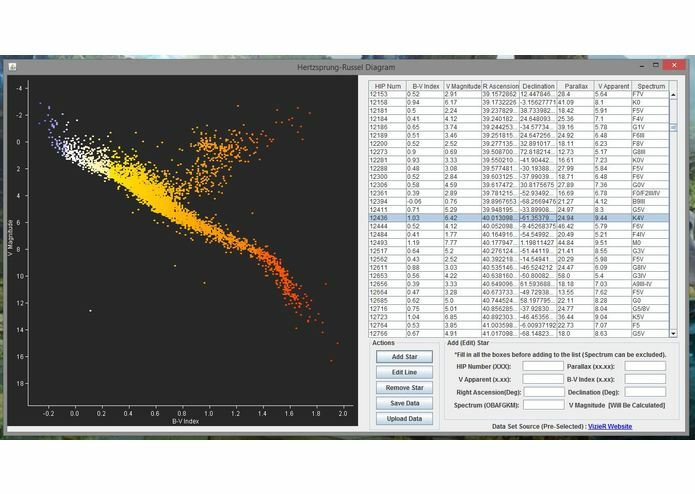 we had difficulties creating an interactive table that allows you to highlight multiple entries and display the selection in the scatter plot on the right. functioning at full capacity with very little amount of sleep. being able to get a working standalone prototype that can run on any operating system up and running by the end of the event as well as create an informational website. programming is hard, but rewarding.